What is a Florida Quit Claim Deed? Florida Quit Claim Deed: What Is It? In Florida, a quit claim deed is a document that transfers ownership from one person to the next in an expeditious manner without a guarantee or warranty on the property. Unlike a warranty deed that guarantees that the title of a property is free and clear of encumbrances and that the seller is the legal owner, a quit claim deed only guarantees that the seller is transferring his or her interest on the property and is abandoning their legal right to return at a later date and claiming an interest. 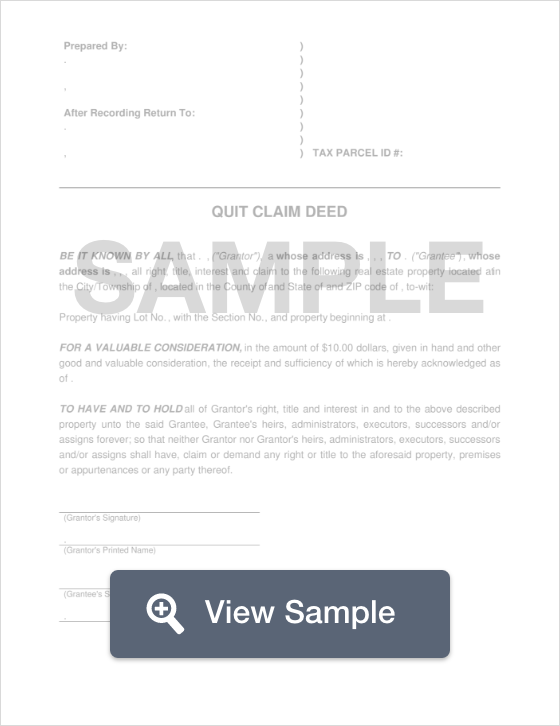 A quit claim deed is often used in property transfers between family members, however, can be used in any situation. Regardless of the transaction, a title search should always be conducted before finalizing a transaction. Appraiser’s Parcel ID Number - The parcel identification number of the Property Appraiser must be included on this form. Every appraiser is given a parcel ID number by the city or county, and this number (or a blank space for the number to be filled in) must be included. Signing - The Grantor of the property (the person transferring their property) must have their quit claim deed witnessed by two (2) separate witnesses in the presence of a Notary Public before having the document notarized and filed with the County Recording Office. Recording - Once the document is properly completed, signed, and notarized, it must be filed with the appropriate County Recording Office. Be sure to check the requirements with your respective county, as some counties require that a self-addressed stamped envelope be included with the proper filing fees.